A New York City cab driver was stabbed repeatedly Monday night after a passenger reportedly demanded to know if he was Muslim. 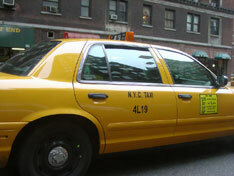 Michael Enright, 21, hailed a cab on Monday night on Manhattan's east side. After entering the vehicle, the AP notes that Enright allegedly asked his driver, Ahmed H. Sharif, if he was Muslim. Sharif responded with a yes, prompting the intoxicated Enright to allegedly pull out a pocket knife tool, reach for the driver's seat and slash him. New York Police Department spokeswoman Kim Royster told the wire service that Sharif was treated for gashes to his throat, upper lip, forearm and thumb. The New York Taxi Workers Alliance identified Sharif by name, and in a related news release, added that the confrontation "occured amid tension" over plans for the new cultural center and mosque near Ground Zero. Within that same document, Sharif, who has served 15 years as a cab driver, expressed sadness over the current climate his profession is facing. The passenger has been charged with attempted murder as a hate crime. Congratulations go to Pam Geller, Glenn Beck, and Pat Robertson.